One of the most well-publicized success stories of post-Hurricane Katrina New Orleans is the series of architect-designed houses built by Brad Pitt’s Make It Right Foundation in the Lower Ninth Ward, one of the city’s hardest hit neighborhoods. Less known is the foundation’s nearly three dozen innovative community development projects that fulfill the everyday needs of the reconstructed neighborhood, including shared gardens, a comprehensive stormwater-mitigating landscape plan, a micro farm, and a playground. Eco-Playground, designed by landscape architect Tim Duggan, uses recycled materials as well as state-of- the-art playground equipment including a solar-powered digital component that encourages children to play physically active games. 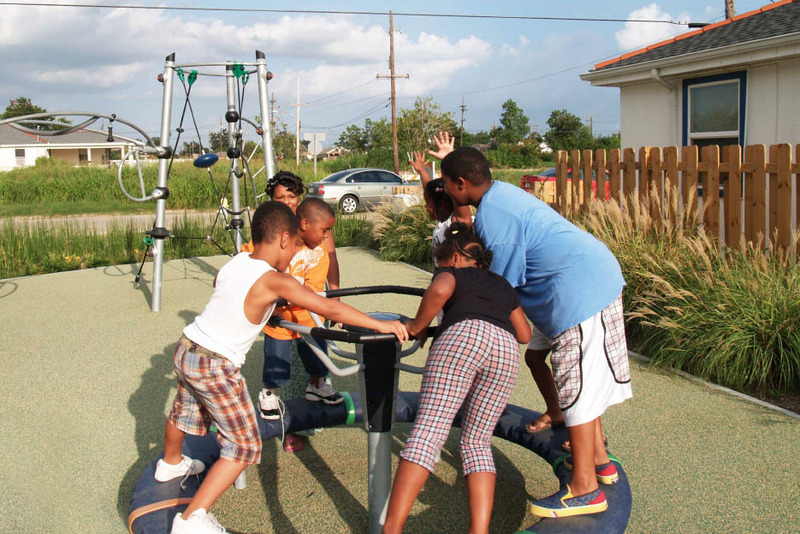 Make It Right’s work in the Lower Ninth Ward is a model of ecological and innovative neighborhood revitalization.